GitBook with downloadable PDF/EPUB/MOBI, without API reference. RapidJSON is a JSON parser and generator for C++. It was inspired by RapidXml. RapidJSON is small but complete. It supports both SAX and DOM style API. The SAX parser is only a half thousand lines of code. RapidJSON is fast. Its performance can be comparable to strlen(). It also optionally supports SSE2/SSE4.2 for acceleration. RapidJSON is self-contained and header-only. It does not depend on external libraries such as BOOST. It even does not depend on STL. RapidJSON is memory-friendly. Each JSON value occupies exactly 16 bytes for most 32/64-bit machines (excluding text string). By default it uses a fast memory allocator, and the parser allocates memory compactly during parsing. RapidJSON is Unicode-friendly. It supports UTF-8, UTF-16, UTF-32 (LE & BE), and their detection, validation and transcoding internally. For example, you can read a UTF-8 file and let RapidJSON transcode the JSON strings into UTF-16 in the DOM. It also supports surrogates and "\u0000" (null character). More features can be read here. Reduce memory overhead of each Value from 24 bytes to 16 bytes in x86-64 architecture. For other changes please refer to change log. RapidJSON is cross-platform. Some platform/compiler combinations which have been tested are shown as follows. Users can build and run the unit tests on their platform/compiler. RapidJSON is a header-only C++ library. Just copy the include/rapidjson folder to system or project's include path. Execute git submodule update --init to get the files of thirdparty submodules (google test). Create directory called build in rapidjson source directory. Change to build directory and run cmake .. command to configure your build. Windows users can do the same with cmake-gui application. On Windows, build the solution found in the build directory. On Linux, run make from the build directory. On successful build you will find compiled test and example binaries in bin directory. The generated documentation will be available in doc/html directory of the build tree. To run tests after finished build please run make test or ctest from your build tree. You can get detailed output using ctest -V command. It is possible to install library system-wide by running make install command from the build tree with administrative privileges. This will install all files according to system preferences. Once RapidJSON is installed, it is possible to use it from other CMake projects by adding find_package(RapidJSON) line to your CMakeLists.txt. This simple example parses a JSON string into a document (DOM), make a simple modification of the DOM, and finally stringify the DOM to a JSON string. // 1. Parse a JSON string into DOM. // 2. Modify it by DOM. Note that this example did not handle potential errors. The following diagram shows the process. tutorial: Basic usage of DOM API. simplereader: Dumps all SAX events while parsing a JSON by Reader. condense: A command line tool to rewrite a JSON, with all whitespaces removed. pretty: A command line tool to rewrite a JSON with indents and newlines by PrettyWriter. capitalize: A command line tool to capitalize strings in JSON. messagereader: Parse a JSON message with SAX API. serialize: Serialize a C++ object into JSON with SAX API. jsonx: Implements a JsonxWriter which stringify SAX events into JSONx (a kind of XML) format. The example is a command line tool which converts input JSON into JSONx format. schemavalidator : A command line tool to validate a JSON with a JSON schema. prettyauto: A modified version of pretty to automatically handle JSON with any UTF encodings. 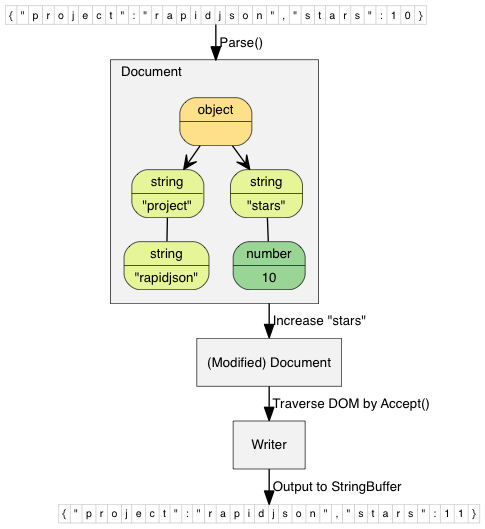 parsebyparts: Implements an AsyncDocumentParser which can parse JSON in parts, using C++11 thread. filterkey: A command line tool to remove all values with user-specified key. filterkeydom: Same tool as above, but it demonstrates how to use a generator to populate a Document.